Teachers become the students again with Bullis Charter School’s STEAM Project-Based Learning practicum. 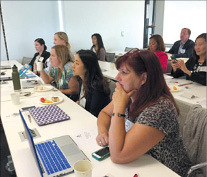 After a successful first year, the Santa Clara County Office of Education and Bullis Charter School kicked off the second Science, Technology, Engineering, Arts and Math Integrated Project-Based Learning practicum for educators last week. The inaugural practicum drew participation from more than 40 educators in Santa Clara County schools, exceeding expectations. The demand for the project led to an expansion with this year’s workshops, seminars and symposium. Under guidance from Bullis Charter School and the Office of Education, school educators learn about the STEAM educational model through interactive videos, one-on-one training sessions, seminars and tours of the charter school. The program aims to empower and equip participants with the tools to improve teacher quality and enrichment opportunities for students. The practicum showcases the highlights of public education when schools come together to share best practices and learn from one another. The first session of this year’s practicum, the Tinkering Workshop, took place Sept. 15 at the Exploratorium. The yearlong series culminates April 21 and May 11 with a STEAM Pre-Symposium at the Santa Clara County Office of Education in San Jose. For more information, visit bcssteam.weebly.com.